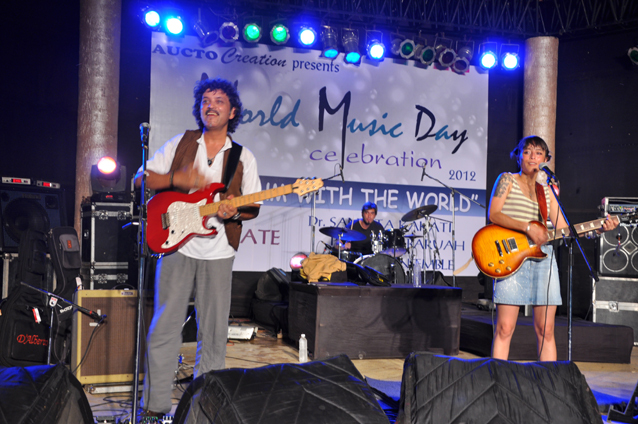 World Music Day is observed throughout the world on June 21. Though the concept of observing this day is very new in Northeast India, it has picked up tremendously within just a few years and nowadays, a number of events are organized in the region to commemorate the day. 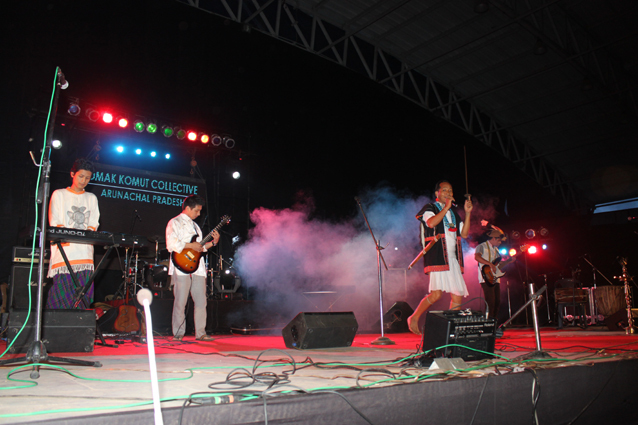 The Rattle & Hum Society of Nagaland has been at the forefront of the celebrations as they have been touring different cities of the country in the form of the Handshake concert on June 21 every year. The concert, which kickstarted in Guwahati in 2008, touched international shores this year as 25 top notch artistes from India performed in front of a 10,000 crowd in Thailand. The list of performing artistes who shared the space with Thai artistes in Bangkok were Pt Viswa Mohan Bhatt, Tetseo Sisters, OFF Band, Zowe Madrigal, Kenei Chale, Zeliang Dance Troupe, Avancer, etc. The handshake concert was jointly organized by the Ministry of Commerce, Government of Thailand and the Rattle and Hum Society with the support of the Government of Nagaland. “The Handshake concert is a non-profit concert aimed towards promoting music, culture and goodwill among the people of the country through “a handshake at a time”. 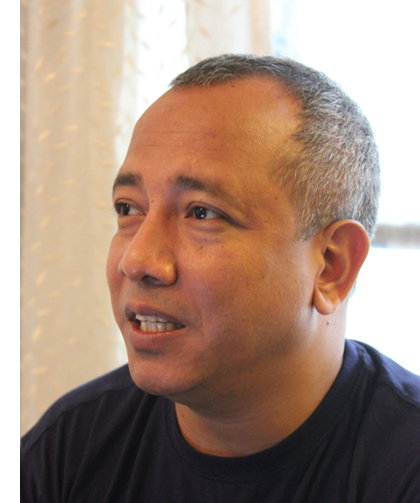 With the first edition of the Handshake concert being organized in Guwahati in 2008, the event has till now travelled to Delhi, Mumbai and Bangalore,” says Theja Meru, president of the Rattle n Hum Music Society. Besides the handshake concert, all the eight States of Northeast India observe World Music Day in their own ways, but this time around the major draw among them all would be the celebrations organized in Shillong by NEZCC. Held in the convocation hall of the North Eastern Hill University, the show featured artistes from all the States and was undoubtedly one of the best concerts to have been held in quite some while. 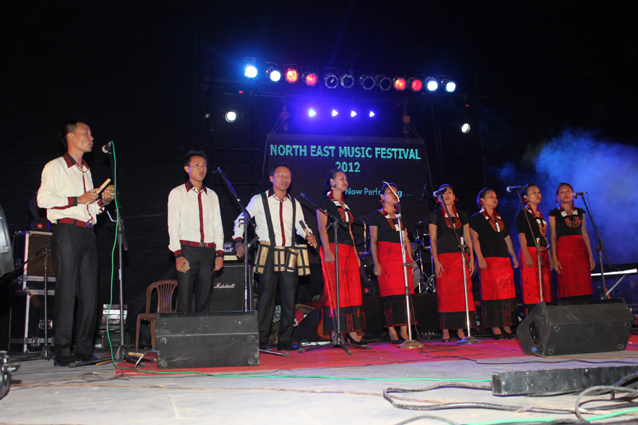 The NEZCC North East Music Festival, held as part of the Silver Jubilee celebrations, sought to celebrate the diversity of Northeast Indian culture for it brought together eight stellar performing troupes whose compositions have been inspired by the ethos of the land to a considerable extent. One of the major highlights was the performance by Shillong Chamber Choir, which had incidentally hardly ever performed in their hometown of Shillong before tasting international acclaim. The other States of the region were represented by a wide spectrum of artists spanning various genres, which included the Omak Komut Collective of Arunachal Pradesh, Assam Bamboo Band, Guru Rewben Mashangva of Manipur, Voices Na Rympei of Shillong, Meghalaya, Riakmaw Musical Band of Mizoram, Nagagenous from Nagaland, Sosium of Sikkim and Chanu Miah & Group of Tripura. All these performers were a treat to watch as they brought various parts of their life and traditions on stage. While Omak Kamut Collective is led by a pagan priest of Arunachal Pradesh who blended tribal chants with contemporary western beats, Assam Bamboo Band and Nagagenous used bamboo instruments to provide a wide medley of sounds. Voices Na Rympei, which is one of the very few acapella bands in the country, also performed. Like previous years, Rajib Rana too organized his round of yearly celebrations in Guwahati to commemorate World Music Day. 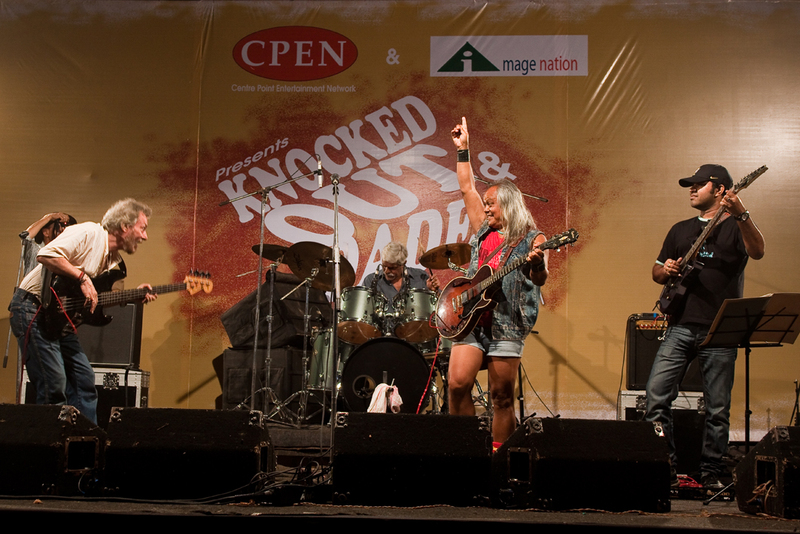 Held at Shradhanjali Kanan, the event saw a number of musicians and bands, including popular Blues rock band Soulmate, performing to a sizeable audience of music lovers. Herein a brief mention of the history behind the celebrations would not be out of place. A musician himself, the World Music Day celebrations started as a home jam in Rajib’s house wherein musicians of different genres were invited to jam and interact with one another. Keeping with the essence of the day, the thrust of the celebrations is on World Music and a number of folk artistes and experimental bands perform on the occasion. Some groups which have performed in the celebrations in the past includes Jambili – an experimental Karbi folk-metal band that blends traditional Karbi music with western rock, Mushtaq Ahmed on the Dotora, The Lavender Group from Shillong, countless other traditional and folk artistes. The event slowly expanded and was held in collaboration with NEZCC at their cultural amphitheatre Shilpgram for a few years. An interesting aspect of the entire celebrations is that it is an entirely self-funded effort and the show is held every year on the same, irrespective of whether there is a sponsor or not. “Initially we named the celebrations as Rhythms of the World but gradually, keeping with the changing times we have named it as World Music Day for the last few years. However, irrespective of the name of the event or the availability of sponsors, we will continue with the festival on June 21 every year,” says Rajib, popularly known as Rana. Blue Tooth is the new buzzword in music circles. The group of four experimental musicians who got together last year have been slowly registering their musical prowess and within a very short period of time, have emerged as a frontrunners in the regional circuit. The band is made up of Rishav Bhuyan on the bass, Rituparna Choudhury on guitars, Biraj Baishya on drums and Sameer Baishnab on vocals. Experimental Funk rock is how the members like to describe their music. “While many would regard us to be a funk band, we are more of funk experimentalists. Besides just funk, we have a lot of other influences like Spin Doctors, John Mayer, Vitor Wooten, The Meters, part of which we try and combine with funk. The group has participated in a number of competitions and performances since they got together. Mention can be made of their stellar performances in the Great Guwahati Run on January 1 this year which encouraged the people of the city to run for a cause. The Run, which was organized by Ankur Bora and supported by Assam Foundation of North America (AFNA) and the Friends of Assam and Seven Sisters (FASS), sought to spread awareness about helping underprivileged children and marginalized sections of society. Bluetooth had earlier won the Pyrokinesis rock competition, runners-up in Synchisis. Individually too, the members have registered their mark as Rituparna Choudhury and Biraj Baishya picked up the best Guitarist and Drummers award in Pyrokinesis, while Rishav Bhuyan and Sameer Baishnab won the Best Bassist and Best vocalist award in Synchisis. It should be noted that the Best Bassist Award in Synchisis was dedicated to the memory of late Rakesh Baruah and the jury for the award constituted veteran musicians like Satyakee D’Com Bhuyan and Suman Dutta. Watch out for Blue Tooth. It was a concert in Goa with a difference. A musical tribute to the legendary Anthony Gonsalves concluded in Goa in the last week of June. The event organized to commemorate World Music Day however also sought to celebrate the musical vibrancy of Goa and Northeast – two most vibrant musical destinations of the country. The event was organized by Music Mania Foundation of Goa in association with NEZCC, Dimapur and Eastern Beats Music Society. 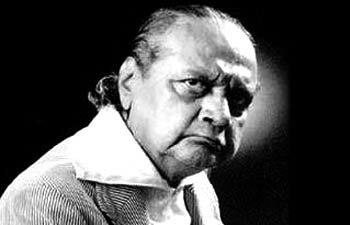 The three-day musical tribute to the unforgettable legend and genius, Anthony Gonsalves, who changed the scenario of the Indian Film Orchestra with his arrangements in the 1950s and 60s, included a number of artistes from various parts of the country. The event sought to celebrate the musical diversity of the country through a slew of performances spread over three days. A special attraction was the focus laid on Northeast India and Goa – two highly vibrant regions as far as culture is concerned but markedly different from each other. “We hope this festival helps initiate better understanding about each other’s culture and traditions amongst the people of both regions,” Colin Savio Coelho of Music Mania Foundation of Goa said. 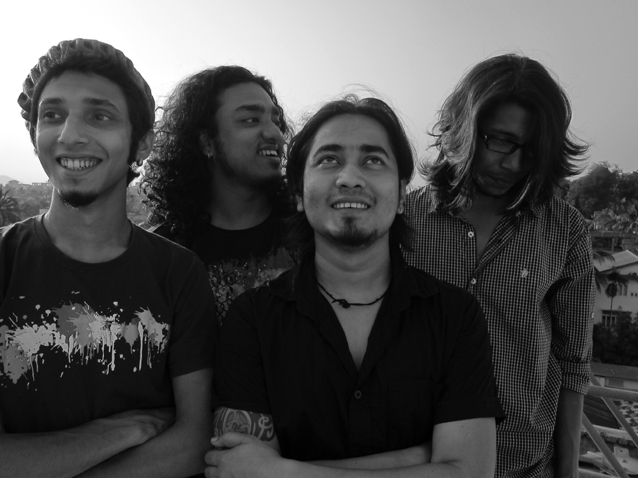 Thrice Grammy-listed experimental Naga band Abiogenesis headlined the second day of the festival, which also featured Simple Truth and Black Slade from Delhi. Abiogenesis, which has developed its own brand of Howey music, played with a repertoire of western instruments supplemented by the sound of the Bamhum – an instrument developed by its member Moa Subong. The band has earned critical acclaim for taking traditional Naga sounds and merging it with contemporary musical genres to create a beautiful medley. The thirds day of the festival was dedicated to GOEMKAR AMI KHAS and included a Konkani musical evening with Konkani musicians and bands besides featuring Rhythm n Blues and Lulu. “Some of the highlights were performances by Fanchu Mendes (double bass) and Franky (Piano) and Salvador Pereira (violin and piano) and many more,” Colin informed. Not just cultural dialogue, the festival also sought to uphold the spirit of World Music Day as the Music Mania foundation felicitated Goa’s famed violinist Emiliano da Cruz with a Lifetime Achievement in Music award. Initially formed with the objective of harnessing the healing power of the arts to bring about development in strife-torn and rural areas, the Eastern Beats Music Society has been undertaking a number of initiatives towards its objectives. It organizes the Karbi Anglong Beats contest as part of the traditional Rongtheang festival of Karbi Anglong so as to strengthen the bonds of unity among people of different tribes and communities and prevent minor quarrels from erupting into ethnic clashes. The society also seeks to initiate cross cultural dialogue between artists from the region with those from other areas. Its landmark event – Guwahati International Music Festival which was held last year – saw 35 top artists from the Northeast and countries like UK, Nepal, USA merge together on a common platform to showcase their music and exchange their diverse cultural ethos and traditions. The festival will be held again in November this year, a EBMS secretary informed. The music landscape of Shillong and other parts of the region came alive once again recently with the birthday celebrations of Bob Dylan. The birthday celebrations have been organized by Lou Majaw with unfailing regularity in Shillong from May 24, 1972. This was the 41st year of the birthday celebrations and it extended for three whole days. Starting on May 24 at Cloud 9 lounge in Shillong, this year’s edition was dedicated to creative expressions – a blend of music, poetry and panting. Accordingly, besides the jamming and music sessions, an evening of poetry was also coordinated by noted poet and folklorist Desmond Kharmawphlang at Cafe Shillong. “Anyone can come and share their joys, pains and sorrows through the medium of songs and poetry,” said Kharmawphlang, who had a number of well-known poets like Kympham Singh Nonkynrih giving him company. The festival concluded at Umiam Lake where a host of musicians, including Whirling Kalapas led by Uday Benegal and American singers Parker Ainsworth, Jeff Harding and Skye, also performed. “Every day we are being bombarded by one absurdity after the other. There are too many dos and don’ts. But what I believe is that the music must go on. Forget politics and save music,” Lou said in the sidelines of the festival. What started off as a small fest, however, has now grown into a mega festival, with its popularity spilling over into other major towns and cities of the region. After Shillong, the first city to fall prey to the Dylan craze was Guwahati. 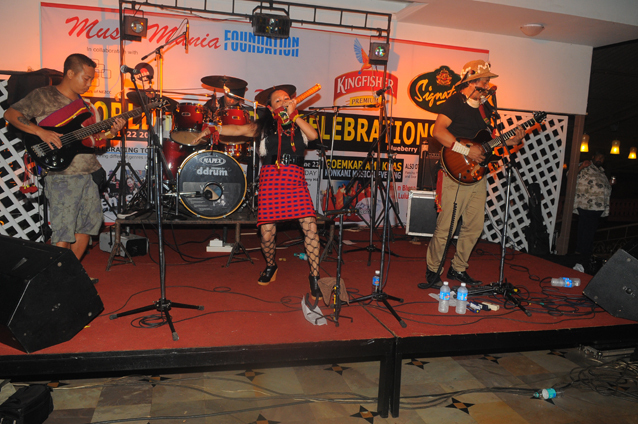 Musicians and music lovers of the gateway city who have attending the Shillong tribute with unfailing regularity had started their own tribute concert last year. 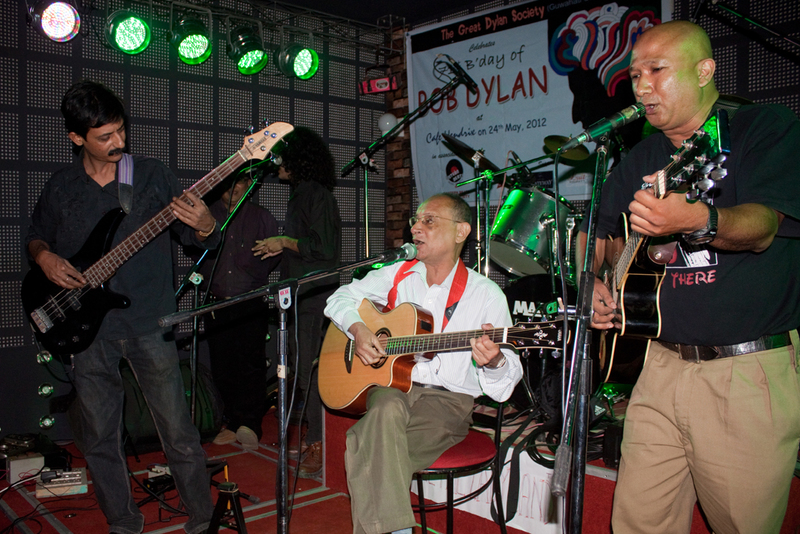 Christening themselves as the Guwahati chapter of the Bob Dylan society, these musicians join Lou celebrate Dylan’s birthday over a distance of 100-odd kilometres. So as the celebrations in Guwahati began with a poignant rendering of Blowing in the Wind by Dr Nandan Phukan, one could truly feel the Lou-led tribute fever wafting down the hills from Shillong. The Great Dylan Society (Guwahati chapter) was joined by a host of veteran musicians, including Monojit Barooah, Amlandeep Das, Bala Bhadra Hagjer, Sandeep Gogoi, Sumon Duarah, Anup Dutta, Hridoy Goswami, to name a few. 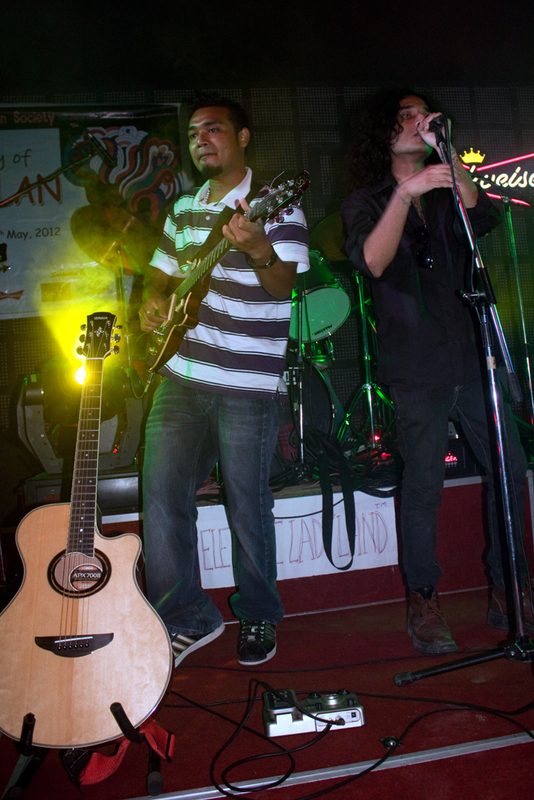 Guwahati-based bands Bluetooth and Bolt from the Blue also performed their own sets of originals and popular Dylan numbers, which included Just Like a Woman, Like a Rolling Stone, Baby Blue, All Along The Watchtower, amongst others. While the duet between Amlandeep Das on guitars and Bala Bhadra Hagjer on the harmonica was received with much applause, the performance of Sarah by Monojit Barooah, who was accompanied by his son Pratik Barooah and Anup Dutta, really took one back on a nostalgic ride. Dimapur – the commercial capital of Nagaland, located some 380-odd kilometres away from Guwahati – also could not miss the Dylan fever as a few musicians celebrated the day with a jamming session at Hiyo café. 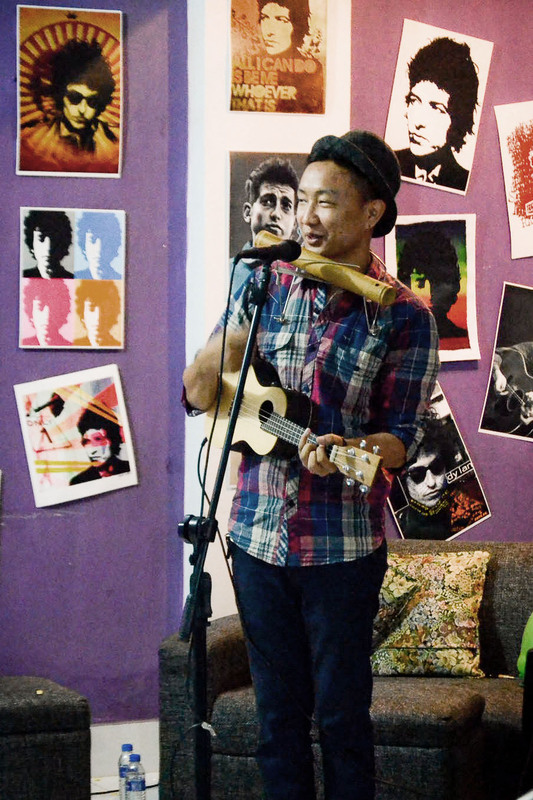 Popular Naga singer Alobo Naga, Naga Idol renbeni Idyuo were the main performers for the evening even as a host of other musicians got together for an evening of jamming and poetry. Thanks to Lou Majaw, Dylan certainly lives on in Northeast India. And judging by the way the tribute celebrations are going, he will surely do so for quite some time to come! 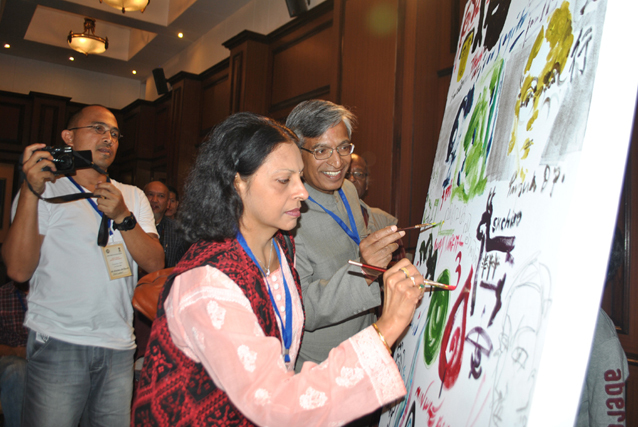 ICCR Director General Suresh Goel inaugurated a mega artist residency between Indian and ASEAN artists at Mayfair Hotels and Resorts in Darjeeling on June 10. The event, Merging Metaphors, which continued for a week, was participated by 25 artists from 10 countries, including Singapore, Brunei, Cambodia, Indonesia, Laos, Malaysia, Myanmar, Thailand, Vietnam and India. The list of veteran artists also included Ganesh Gohain from Assam. 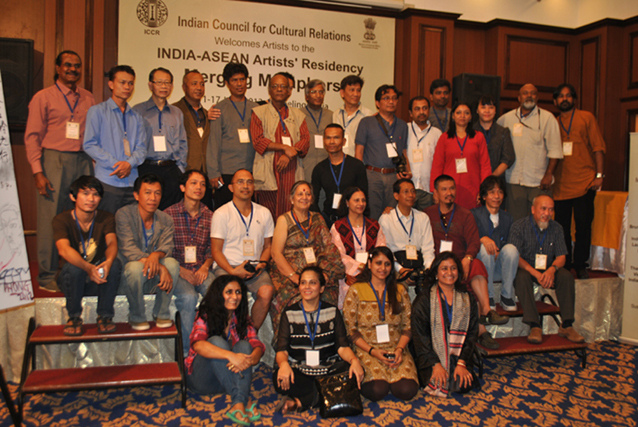 The creative joint sought to forge a sense of bonding and solidarity between the ASEAN community and India – countries that have shared cultural roots and geographical proximity – for further bonding through art. Given the unprecedented surge, and prestige and place of contemporary art in cultures of the world, as a continuum of living traditions, it seems appropriate to use this platform to promote cohesion and thereby economic and all around development for a better society, ICCR Regional Director R Chatterjee, who informed me about the venture, said. Curated by Sushma K Bahl jointly with Archana B Sapra, the project involves the artists living, working and interacting with each other in a mix of structured program and open-ended options and informal gatherings to make it a forum for reflection, relaxation and rejuvenation of the body and mind leading to renewed creativity, and expression with scope for collaboration. There will be time and facilities to draw, paint, write or do other things in the mornings, visits to local sites of art historical/cultural significance in the afternoons and discussions/interactions/slideshows in the evenings to facilitate networking, information sharing and building mutual understanding. “The look east policy of India is inspired by these civilizational links and our common aspirations for socio-economic growth in contemporary times. The residency provides an opportunity for the painters from these countries to share their creative ideas and further explore these commonalties” continued Dr Suresh K Goel. The scenic Darjeeling in Eastern India with its cool hills, old monasteries and vast tea estates selected for the residency provided the back drop, and inspiration for the group to create a new body of work that will be added to the ICCR’s collection for display in its offices in India and elsewhere. It will be shown first in the host country- India and then hopefully some of the ASEAN member countries – Brunei, Cambodia, Indonesia, Laos, Malaysia, Myanmar, Singapore, Thailand and Vietnam. The sessions and interactions during the residency and the resulting work documented in an illustrated catalog will be published by ICCR and launched during the inaugural show in July. The participants of the residency were mostly mid-career artists with a good track record and engaged in innovative art with aesthetic merit. They include painters, new media artists, designers, photo artists, sculptors and others working in varied media to present an overview of the contemporary art scene in the region with glimpses of its diversity and vibrancy. The list of participants included the likes of Mr. Osman Mohammad, vice president of Brunei Art Forum who is actively engaged in promoting art in his home country. His repertoire in varied forms and multimedia; ranges from art and design to broadcasting, management and development; Cambodian painter and multi-talented artist Svay Sareth, Ivan Sagita from Indonesia who is a winner of the Silver at Osaka Biennale; Nivong Sengsakoun and Saykham Oudomsouk from Laos, Dato SK Choo of Malaysia, Min Wae Aung and Zaw Mong of Myanmar, Quek Kiat Sing from Singapore, Nataphon Na Nakorn from Thailand, Sac Ngo van from Vietnam, Assamese artist Ganesh Gohain, Pampa Panwar, Seema Kohli, and others. A post-graduate diploma holder in fine arts from the M.S. University at Vadodara, versatility and a melding of the past and present congeal in the sculptural and graphic works of Ganesh Gohain. Hues of metals and nature weave a new concept of classic forms in contemporary form and perception. Numerous subtle forces seem to play beneath the surface of his work, juxtaposing historical contexts with contemporary cultural epoch. Recipient of the French Government Scholarship, he spent a year at L’Ecole Superiure Des Beaux Arts, Le Mans, France and with the Charles Wallace Fellowship Award, he did a residency in Glasgow, U.K. His work has been shown in group exhibitions across India and overseas, including solo shows at the State Art Gallery in Assam, the Nehru Centre in London, the Kelvin Grove Museum and Art Gallery in Glasgow, and the L’Ecole Superiure Des Beaux Arts in Le Mans. Aside from exhibitions, he has also participated in numerous artists’ workshops. Ganesh lives and works in Vadodara. If Shillong created a national record in 2007 with the help of the legendary Bob Dylan, Guwahatians have their own Bhupenda to turn to. Jajabor 2012 proved this without an iota of doubt. Northeast India’s tryst with the guitar seems to run deep. After Shillong, it is now the turn of Guwahati to come into the spotlight as a total of 5,406 guitarists strummed together to a tune of late Bhupen Hazarika last week to enter their way into the Limca Book of World Records for the largest guitar ensemble. 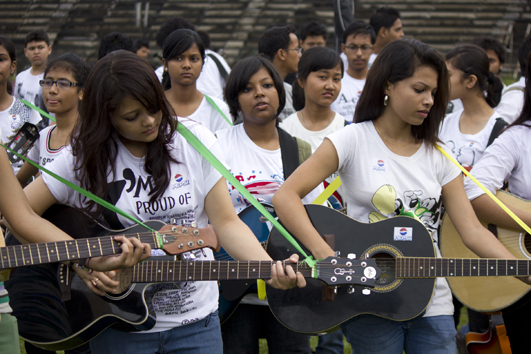 Shillong had earlier created a national record for largest guitar ensemble in 2007. The Guwahati guitar ensemble, Jajabor 2012, was organized by Hope events as a form of tribute to one of Assam’s legendary icons late Bhupen Hazarika. And unique it surely was. As 5,406 guitars from different parts of the Northeast, comprising teeny-bopping teenagers to men and women in the late fifties and sixties, strummed to the tune of the Bhupenda’s evergreen, Bistirno Parore Akhonkhyo Jonore, one could just fathom the deep-rooted reverence the people of Assam has for the man who first took Assam to the national cultural consciousness. The guitarists played to the tune of Bhupen Hazarika’s song in a synchronised manner for about seven minutes drawing applause from the audience, even as memories of the late balladeer came flooding back in a rush. Emotions ran high as the participants, irrespective of age and harmony, strummed their guitars, of various colours, shapes and sizes in harmony. Ankur Dutta, a member of the organizing team, said, “We had basically conceptualised Jajabor 2012 as an event to pay tribute to our beloved Bhupen da besides also trying to register a entry in the Guiness Book of World Records. Though we could not create the Guiness record, we did create a new Limca Book of Records.” Limca Book of Record’s representative Ismita Thomas, who had flown down to attend the event, had presented the organizers with a provisional certificate of the organization. The current world record for largest guitar ensemble is held by Poland where 6,346 guitarists played together to a tune in 2009. Jajabor 2012 broke the country’s earlier record, which was created by 1,730 guitarists in Shillong who had played to the tune of Bob Dylan’s famous number Knocking on heaven’s door in 2007. “We are quite happy with our achievement because while Poland created the record as a country we have been able to achieve this as a State,” said one of the members of the Hope Event management group. While Northeast India is known for housing an immense pool of talented musicians, there were initially doubts over the capabilities of Guwahati to hold such a guitar ensemble. “Shillong is the first name to come to mind whenever we talk of the guitar. Though there are a lot of guitarists in Guwahati, we were not really sure whether Guwahati could pull off the feat. Plus organizing an ensemble where so many people are involved is no mean feat as one has to make transportation provisions and also special arrangements for young children,” says Animesh Bhuyan, an amateur musician and rock and roll fan. But pull off, it certainly did and how. As the weather gods threatened to play spoilsport with an overcast sky and occasional bursts of rainfall, enthusiastic Guwahatians waited in the sprawling Sarusajai stadium since morning, eager to set a new record. Assam Cultural Affairs Minister Pranati Phukan set the mood for the record by singing a few lines from Ganga Behti Ho Kyo, the baladeer’s famous Hindi version of one of his popular numbers. Bhupenda’s sister and well-known singer Sudakshina Sharma was also present to encourage the participants. The tremendous response of Jajabor has bolstered the spirit of the organizers who have set their eyes on greater dreams – the Guiness Book of World Records. “Though we were optimistic right from the beginning, the tremendous manner in which people turned up for Jajabor has bolstered our spirits. We will organize another event next year where we will try to create a new world record,” said one of the organizers. Bhupen da surely lives on in Assam and is likely to do so for ages to come. And, oh my, how!